5% discount is offered for Active Military, Police, Firemen, Veterans, Good Sam, and TACO. Security deposit is required at the time of reservation. Daily Rates– book three nights and get the 3rd night free for June, July and Aug. Monthly Rentals – for $399.00 for select back in sites for June, July and August. The Vineyards of Fredericksburg has affordable rates based on two occupants and up to two pets. High definition all digital DirectTV – at no extra charge. Reliable WiFi – at no extra charge. Pet friendly – TWO PETS MAXIMUM per site. Up to 6 PEOPLE MAXIMUM per site can be accommodated at additional cost. For groups of friends and those who rally, plenty of meeting and cooking space to gather in. Call (830) 992-1237 for more information on group rates. 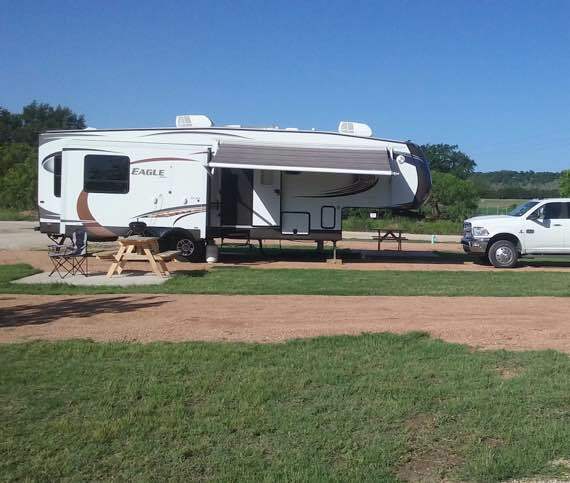 Finally Fredericksburg has a new park that was designed and built by and for RVers. The owners went “all out” on the facilities and infrastructure. They continually (during our stay) asked us if there was anything further they could do in regard to our stay. As other campers completed their stays I watched as the staff made those sites ready for the next unit… they did everything including raking the site! This truly is a first class “operation” and yes… we’ll be back! Perfect for us. Large lots, great WiFi, quiet, close enough to town. Did I say quiet? Restrooms and showers were not fancy but very nice. It will be our RV park of choice from now on when we go to Fredericksburg. This is a good sized park, generous sites, internet and easy pull throughs. The sights are gravel with lots of grass. Two dog parks. It is a short drive to Fredericksburg, but has a country setting. A good place to stay. Really enjoyed our stay there. The pull throughs are very large and spacious. The place is under new ownership and management. The park and all facilities are really well maintained. We will without a doubt stay in this park again on our next excursion to Fredricksburg.